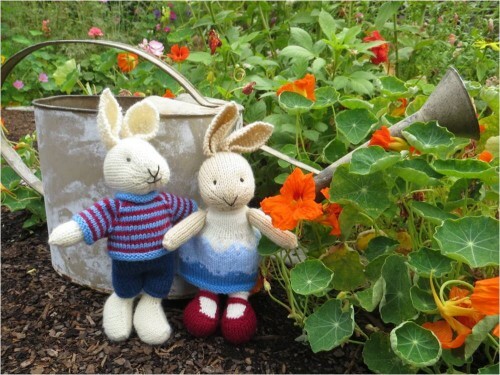 Take a peek at my little knit bunnies in the garden enjoying the flowers. They were knit from Julie Williams Little Cotton Rabbits pattern. 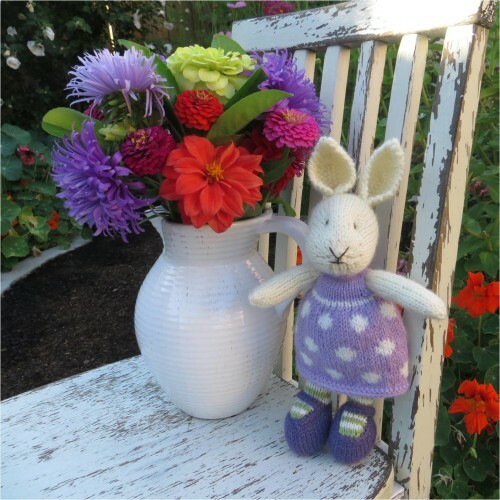 I have followed Julie’s blog for several years now wishing I could knit cute little rabbits and animals like hers. It was a happy day for me this summer when she released a pattern for a boy and girl bunny and some extra bunny dresses. I love starting with balls of yarn in beautiful colors and creating something with a cute face and clothes. Julie’s patterns are well written with lots of photos and detailed instructions. They do require some knitting experience so if you don’t know how to knit take a few lessons. I think they would make cute gifts, but right now I’m too attached to my little knit bunnies and I don’t think I can give them away! A late summer bouquet of asters, green envy zinnia, dahlias, zinnias and laurel leaves. I love the green envy zinnia combined with the purple aster in my garden this year. It was the inspiration for this sweet bunny’s dress, tights and shoes. I use Plymouth Encore Yarn in DK weight to knit my bunnies. One bunny is cute, but two together are twice as fun. Don’t you love her Mary Jane shoes? I also enjoy knitting little mice from Alan Dart’s Knitting Patterns. He has a wide variety of toys you can knit. His patterns are available to download on his website. If you are new to knitting or toy knitting I highly recommend Susan B Anderson‘s online toy knitting class on Craftsy. I have watched it several times and have learned so many great tips and techniques. You can find it here. I’m in love with your mice and bunnies – how beautiful – and your garden is a perfect backdrop for them! your bunnies and mice are absolutely adorable!! ahhhh, these are all quite adorable! Tammy your bunnies turned out so cute. I love your blog! Oh they are so so cute !! If my to-do list wouldn’t have been so so long sure I’d love to try ! Oh! Your knitted bunnies and mice are adorable! Oh, aren’t you clever? You must have had fun making them. I’m not a knitter but my mum is, so I’ll search for the patterns and ask her if she would knit a couple for me. Thanks for sharing. These are just darling…you have many talents and your garden shots are beautiful. These are adorable. 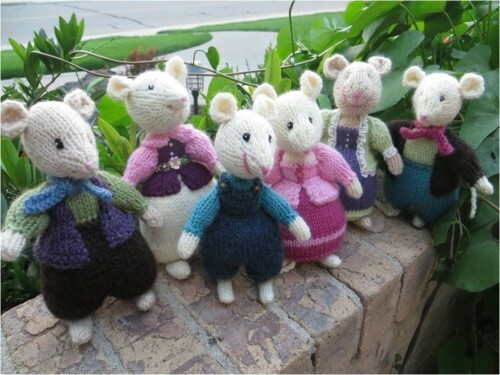 I have no clue how to knit ( or crochet ) but they are so cute…and the little mice are even cuter!! Love them! Those bunnies and mice look darling in your garden!! You have a great talent! Those are adorable! I can knit a straight line. Basically all I’ve made are a lot of simple scarves. I think I need to branch out one of these days. Seeing your adorable animals gives me inspiration. Thank you! Just wanted to thank you for linking up to the BeBetsy Brag About It party and for adding our link to your page. You are such a dear. Sharon and Denise ♥ oh, she is the one who didn’t get a bunny from our sister… and the story continues. Like fairies, little bunnies and mice look right at home amongst the flowers. I love the bunny with the purple dress. Cute bunnies, enjoying your pretty flowers.